Nature Printing is collective term for techniques of creating images of nature on paper, cloth, or other surfaces with ink, pigment, dyes,or chemicals. Nature printing is one of the earliest techniques in the human art- human handprints in the caves of prehistoric man are a form of nature printing. Plant printing evolved in Europe as a means for the identification of herbs and medicinal plants. Some of the oldest plant prints are those made by Renaissance herbalists. Heather often combines nature printing of seaweeds and water plants with her gyotaku to create underwater scenes. 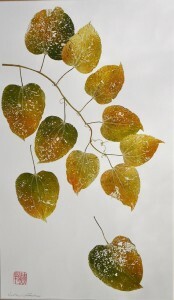 She also uses a 30″ Takach brand etching press to create highly detailed botanical and nature mono-prints.